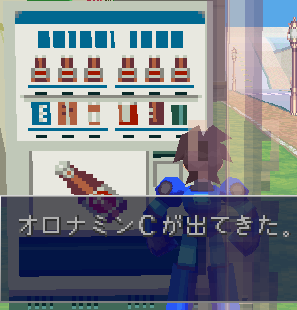 Rockman Corner: Taste Testing Rockman DASH's Famed Soft Drink, "Oronamin C"
Funny. I have had that before, but never knew of it's Legends/DASH tie-in. I do feel refreshed! They sell these in a vending machine down the street from me (and in most places, really). To really enjoy it you have to kick the machine :D (though not in a way that would actually cause attention to yourself). To be honest, I dunno if it's that great. The taste is good, and Japanese energy drinks don't have such a harsh and tart edge like your Red Bulls and what not. But for the price you don't really get much, and I can't say I get any boost from it, popular slogan aside. Incidentally, I am unaware if Capcom had a tie-in, or really even the right to use the brand name. This was before they really clamped down on copyright checks. In the N64 version of the game, it got changed to Drink, and then in the PSP version changed to Juice. Some DASH fans feel it's an unfortunate change. Um, hate to bring this up but, in the last Ask Capcom Chris Svennson offhandedly mentioned a promotional deal with a Japanese soft drink brand as being one of the reasons that Megaman Legends couldn't be cleared for rerelease. I'm guessing this is that soft drink he was talking about. Wow, lol. That's really cool. 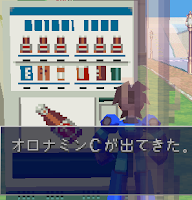 Huh, I see something that vaguely looks like an E Tank among the vending machine's selection. Anyway, this is kinda neat. Good trivia and all that. How does compare to Dekavita C? I get that from time to time at my local Asian grocery stores, and I love that stuff. Heh-heh. "...entitled to own a bottle or two just for kicks."